Gordon Hayward was left feeling "a little bit sore" but says he is making strides with every game after the Boston Celtics consigned the Milwaukee Bucks to a first defeat of the NBA season. 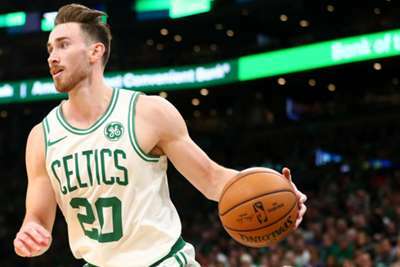 Hayward produced his best performance since returning from a fractured ankle, scoring a season-high 18 points with four rebounds and five assists in a 117-113 victory on Thursday. The small forward landed three of a franchise-record 24 three-pointers for the Celtics, Kyrie Irving leading the way with 28 points. Hayward is still finding his feet after such a long absence, but believes he is gradually putting his injury nightmare behind him. "I can feel it right now [his ankle]," Hayward said. "It's definitely a little bit sore, something new that I haven't done in a while. "Those are things I just have to work through, maybe some scar tissue that I can grind out a little bit. It did feel a little bit sore, but I think it held up just fine. "I have to get knocked down. I have to land on that one foot a little awkwardly, just so mentally I know I can do it, but also physically I can hold and be strong." He added: "It started off with a good start. [I was] just out there competing, playing....I've said it before, but game by game there's different things [he's getting better at]. I'm getting more and more comfortable. "I had some open looks from three that were good, and was able to knock them down, and tonight was good for me."